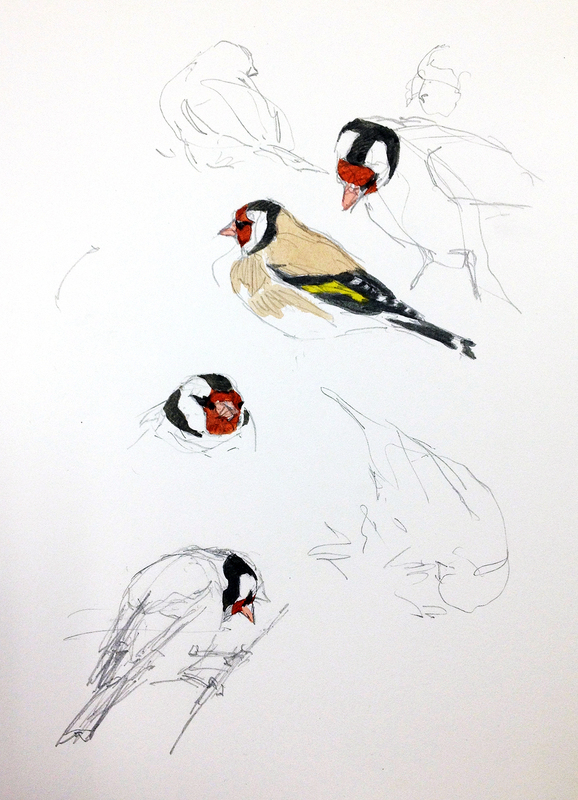 A flock of European goldfinches pick thistle seeds in Doñana National Park. Drawn through the scope, watercolor over pencil in Lana 1590 8 1/2″ x 11″ spiral bound sketchbook. The rain in Spain falls mainly on Sevilla at the moment, where Antman is giving a talk and I am enjoying a few quiet moments of reflection and gratitude on Thanksgiving Day. 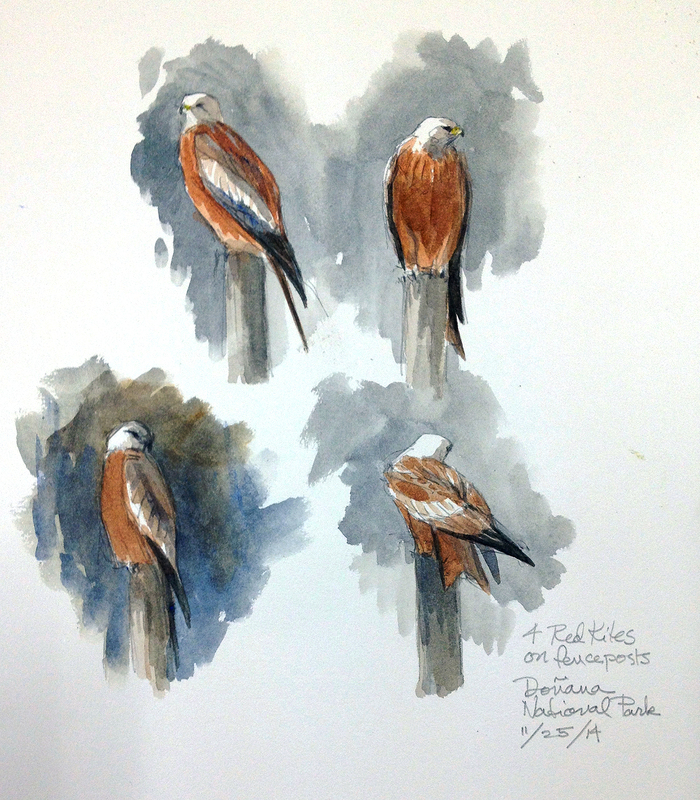 Red kites, Doñana National Park, drawn through the scope. Watercolor over pencil in Lana 1590 8 1/2″ x 11″ spiral bound sketchbook. I’m thankful for our four-month Danish adventure and for family and good health. I’m thankful for the purple swamphen that flapped into view yesterday like a great feathered eggplant. I’m thankful for the benign wariness of the giant bulls of Doñana that allowed me to pass by, uncharged. And I’m especially thankful for the kind hospitality of our new Spanish friends in Sevilla. Stone chat, Doñana National Park. Drawn through the scope on 8 1/2″ x 11″ Lana 1590 spiral bound sketchbook, watercolor over pencil. I’m thankful to you, too, for spending a little time with me at Drawing the Motmot. I’m happy you’re here. 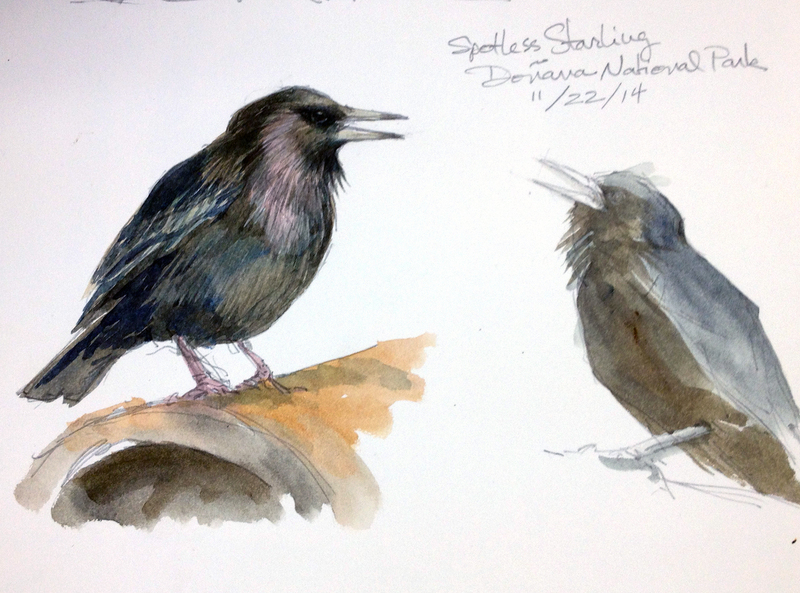 Spotless Starlings, an Iberian endemic, Doñana National Park. 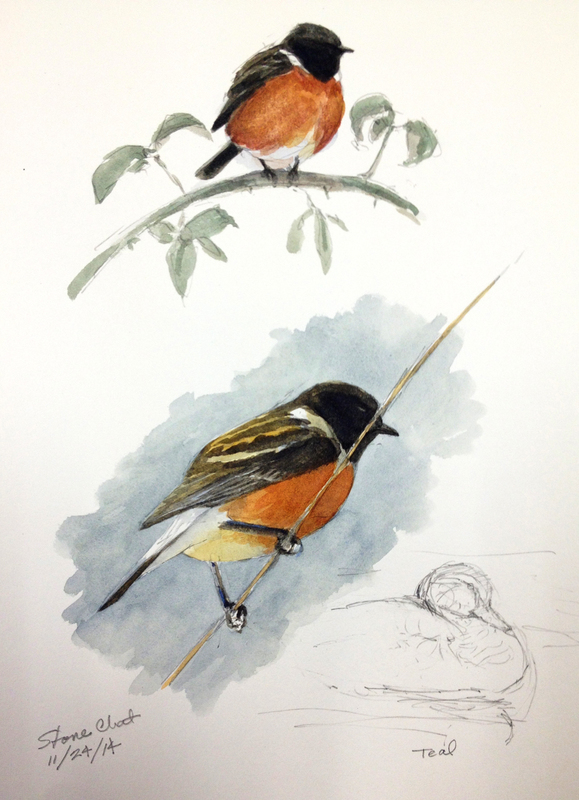 Drawn through the scope on Lana 1590 spiral bound sketchbook, 8 1/2″ x 11″, watercolor over pencil. 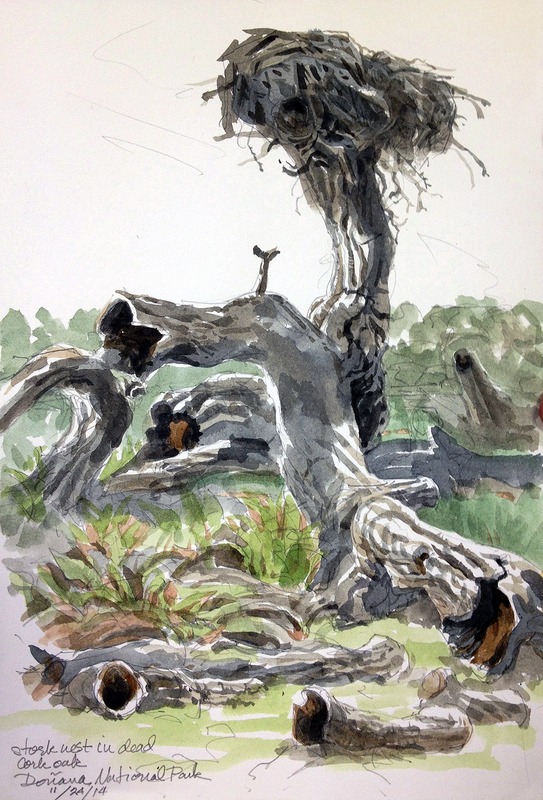 White stork nest in dead cork oak, Doñana National Park. Watercolor over pencil, Lana 1590 spiral bound sketchbook 8 1/2″ x 11″. Tonight we’ll celebrate Thanksgiving with paella and delicious local olives and crusty bread. I’ll be sure to drink to the health of all, probably more than once. A glass of sangria sounds perfect right now. 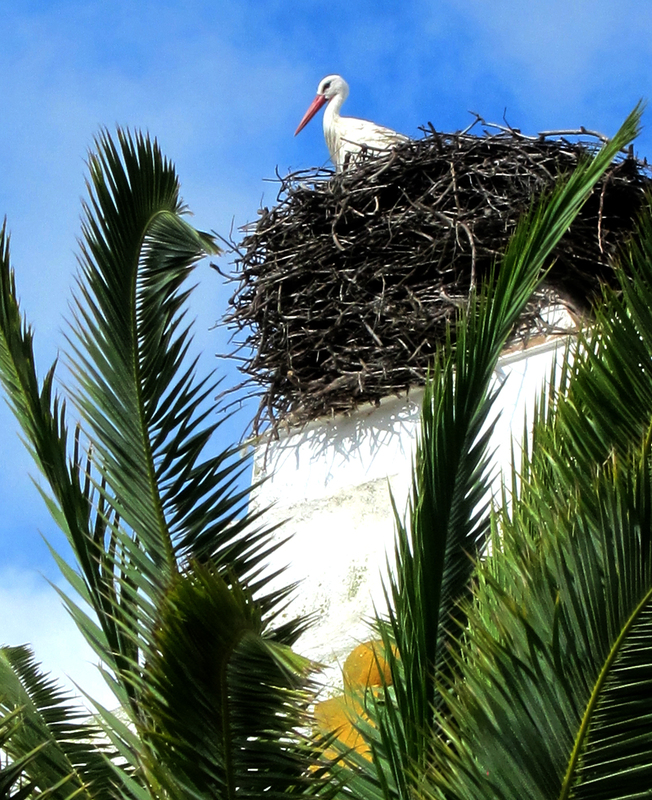 They really do nest on chimneys, and although it looks like one, this white stork is not a plastic lawn ornament. At the Palacio, the biological field station in Doñana National Park, our lodgings for several days of wildlife heaven. Happy Thanksgiving to you! 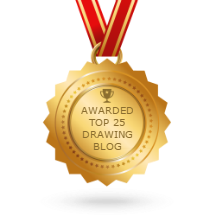 Wonderful drawings. I’m thankful for your generous sharing all these years of your amazing talent. Enjoy the paella! Cheers! And we’re thankful to you for sharing all these wonderful adventures and sketches with us. Yet, wish you were here. Nice to have you over here doing “our” birdies, Debby. Sorry it’s raining in Sevilla. I just watched our church-tower stork fly in for the night and I thought of you. Happy Thanksgiving. Lovely to be in the same part of the world with you, 100swallows. Your birds are really awesome. Happy Thanksgiving to you, too. Very thankful to have these wonderful treats in my inbox. Thanks for brightening my year! Glad to have you here, too, Dinah! A sweet note. I’m thankful that you’ll be coming home soon (right?) and that you will be ready for some adventures of the Oklahoma kind! You have been gone too long. I just got back from six weeks in the middle east and north africa (we were oh so close when you were in Seville) working for Nat Geo Adventures. I fell completely in love with Jordan – my new muse. Just now starting to update my blog with pictures. Hugs from 70 degrees in Oklahoma.